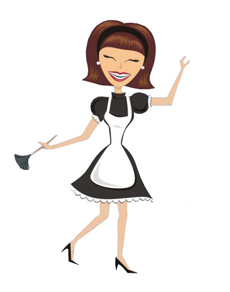 Now it is time to consider pros and cons of cleaning services also known as maid services. Is it worth to spend a little extra money for professionals? It depends on what the company, which you want to hire, can offer you. You ought to know that every professional cleaning provider has its own checklist of the cleaning tasks. So before you ask for the price or scheduling the appointment, you should check if you don’t need some additional services ( an oven cleaning ). They may refuse to do it or they will charge you extra. The cleaning companies commonly provide crews of two, three sometimes four. If you want to have your house cleaned as fast as possible four-member team will be a good solution. My recommendation is the crew of two or, if it is possible, one person, as in Maid Service Chicago. First of all, a small team will do the job more carefully and they focus on the cleaning not on running time. Second of all it could cost you a little bit more for a bigger team ( Your payment covers their trip to your house, so even if it takes half an hour there are four employees ). The members of the team could change very often. It can be annoying seeing different people in your house during the cleaning. In one day, you will come back to a really clean house, in the other day you won’t even recognize if someone visited it. The important advantage of hiring a professional cleaning services is the ability of rescheduling. If you call two day before the cleaning, it should not be a problem to change the service date without extra cost. If you are wondering what is the best way to find reliable cleaning service providers here is some helpful tips and hints.